A former U.S. Marine wants software developers and architects to get more in touch with their feelings. In fact, their lives may very well depend on it. Ken Mugrage, the former Marine who is also a technology evangelist at ThoughtWorks, led a session at the 2017 O’Reilly Software Architecture Conference in New York City, presented a session in which he talked about burnout that software developers and managers can experience in enterprise environments – and how DevOps can help. It can also make it worse, by the way, but we’ll get to that later. This isn’t just a plug for DevOps – it’s a serious issue. Look at the CDC watch list that lists computer programming as an occupation where individuals are prone to suicide. Perhaps more importantly, read John Willis’ blog post titled Karōjisatsu where he recounts the life-changing losses of extremely bright, talented developers to suicide. Burnout is more than stress, it’s deadly. 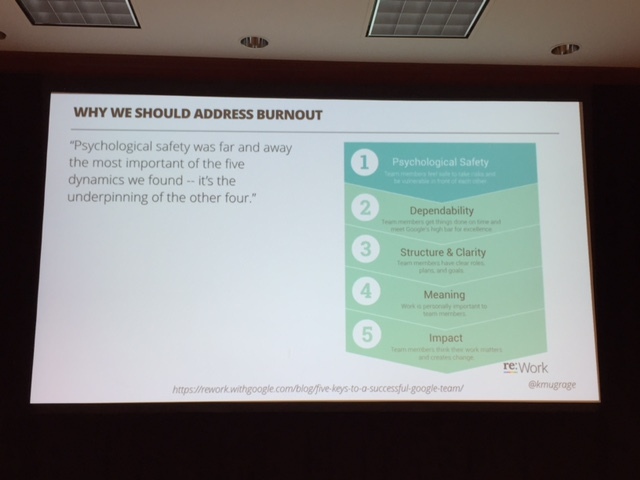 The psychological impact of burnout should not be ignored, Mugrage said. Thankfully, burnout is fixable, Mugrage explained in his talk. And there are reasons beyond just preventing suicide to reduce the chance of burnout. At the end of the day, Mugrage said, people who are happier tend to be better at their jobs. Professional mental health services should always be regarded as the most reliable source of healing symptoms from professional burnout, especially if those symptoms are entering into the areas of depression or potential suicidal tendencies. But there are steps that both managers and teams can take to prevent burnout from happening. One thing, Mugrage advised, is to measure how you feel about your job using professionally designed tests such as the Maslach Burnout Inventory, which has been recognized as the leading measure for burnout symptoms. It can be used by individuals, but corporate subscriptions exist as well. It may very well be worth the investment. Mugrage gave other helpful tips for avoiding burnout, such as protecting your work/life balance and possibly getting mental health first aid training. However he did say that the correct implementation of a DevOps culture may be able to help. So how can DevOps help? When implemented correctly, DevOps may be able to address some of the identified causes for burnout, such as feeling in control of your own work and communication breakdowns, Mugrage explained. For instance, good DevOps practices encourage organizations to keep teams as small as possible, Mugrage explained, citing the “two pizza rule” from Amazon. Everyone involved with the product is on the same team, and they share resources freely, creating a better back-and-forth between workers. 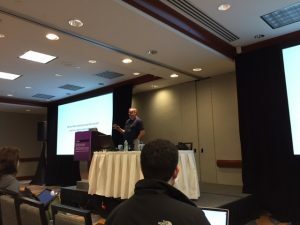 Ken Mugrage addressed a crowd at the O’Reilly Software Architecture Conference in New York City about the issue of burnout in software development. The other thing DevOps can provide, Mugrage said, is a feeling of fairness in terms of project responsibility. In a true DevOps world, there is no “passing the buck,” so to speak, when something goes wrong – everyone is responsible for their own part of the project. Everyone is measured the same way. While it does mean that some people may feel more stressed, it makes people comfortable to know they work in an environment where they won’t get blamed for someone else’s mistake. However, DevOps can’t solve all your problems, such as those related to work overload or any issues that arise from bad company values. And if DevOps isn’t practiced correctly – i.e., you established a completely siloed DevOps team – you may actually make some issues worse. It’s a real issue that requires real solutions. Hopefully well-practiced DevOps, in addition to the other considerations listed above, can help. If you need help, talk to someone, and don’t forget that at the end of the day your job should make you happy, not miserable.